Ben Whittier leads the Organisation and People Development function for The University of Nottingham Ningbo China (UNNC). He just published an article « Bye, Bye, Human Resources? » about the changes happening in the HR function : from Human Resources to Employee Experience. 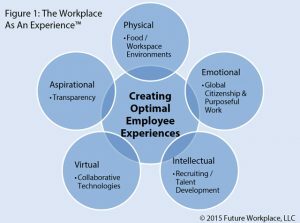 Companies innovating in client experience tend to also innovate in employee experience : AirBnB, Google, Southwest Airlines … « because the employee experience, to a large extent, is the business« . Major HR consulting like McKinsey & Co. or Korn/Ferry International support this « people before strategy » approach of HR. AirBnB’s Chief Employee Experience Officer Mark Levy targets creating employee optimal experience at all levels : physical, intellectual, emotional, aspirational and virtual (see figure 1). This is another demonstration that value(s) are created by people for people. And that employees are not ‘part’ of a company : they are in contractual relationship ! Companies have to focus on creating value(s) for each of their stakeholders : obviously employees are one of the category to be cherished, besides clients but also suppliers and other partners, environment and society, not forgetting shareholders and both investors.